Parents may ask themselves when they should first take their children to the dentist. Many youngsters begin to sprout teeth when they are between 6 and 9 months of age. Others may have no more than eight teeth in their mouths when they are 1 year old. The American Academy of Pediatric Dentistry recommends that children receive their first dental examination by their first birthday. 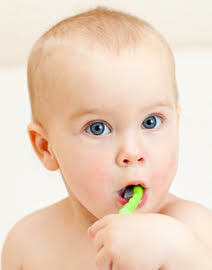 It is important by that time, no matter how few teeth a child may have, to start a regimen of good oral health. Parents also need to know about any dental problems their children may have so these issues can be addressed. It is further recommended that children have their first teeth cleaning by the age of 3. Children and their parents should know what to expect when they arrive at Carter Smile, LLC. They will first be greeted at the front desk by a member of our administrative team, who will provide the paperwork that needs to be completed. This paperwork will later be reviewed to determine whether the child has any allergies or other health or dental conditions that could affect certain treatments. Meanwhile, the family members will be met and escorted by a team member to one of our open-bay treatment rooms located upstairs. Children who are under 18 months of age will be given a quick visual dental examination. Dr. Carter will also discuss with the parents such issues as tooth eruption, the proper techniques needed to clean the teeth of their children and even nutrition as it relates to dental health. Dr. Carter may offer young children and their parents a “show and tell” demonstration of the instruments and techniques used to check and clean teeth. A child might at this point be ready for his or her first dental cleaning. The child’s teeth and mouth will in any case be thoroughly examined, and parents will be given the opportunity to discuss any of their concerns. Children who are aged 18 months to 2 years and who are ready for a dental cleaning will be escorted to one of our treatment chairs. It is there that the child can relax and watch a movie during the cleaning process, which also includes a thorough flossing, the application of a teeth-strengthening fluoride solution and, if necessary, a dental X-ray procedure. The youngsters will even be given a chance to select the toothbrush and toothpaste that will be used in the cleaning. Older children have more teeth, and their parents should be concerned about caring for them as well. These parents will also receive important information pertaining to nutrition and the prevention of childhood dental caries. Upon completion of the cleaning, Dr. Carter will perform a thorough examination of the child’s teeth and discuss the results and any concerns the parents may have. Ever think visiting a dentist can be fun? It will be with such items as a tickle toothbrush and a squirt gun! At the end of the visit, each child will get to select a toy and a sticker that can be taken home. However, the real prizes will go to the parents, who can take comfort in knowing that the teeth of their children are clean and healthy.